January 14 1909 -- Teacher Jessie M. Strickland has been subjected to a board of inquiry when some of her students made allegations against her. Most of the accusations have to do with her having an acid tongue, calling her students, among other things, liars, fools, blockheads and idiots. She allegedly told one that he would end up in a penitentiary, and another, who badly recited a passage about an apple tree, that he should be hung from one such tree. Herriman's take seems to be that a male teacher doing the same things would not have raised an eyebrow, so he points out to female teachers some other manly affectations they should avoid. Wish You Were Here, from the cast of "Mutt & Jeff"
The biggest success in years; houses packed to the doors and the greatest laughing show on earth, "Mutt and Jeff," written around Bud Fisher's world renowned cartoons. Direct from its successful run in New York, Chicago and Boston. Pronounced by press and public the one big novelty of the Age. What blows me away is the amazing make-up on the actors. Usually attempts to make actors look like the characters in a comic strip ends up looking ridiculous, but these actors really do look like their comic strip counterparts. Impressive! Any idea who the actors here are? It appears to be Sam B. Drane (1868-1916) as Mutt and Gus Alexander (1903-1966) as Jeff. Both were featured in a series of live action Mutt & Jeff films for Nestor (a Universal Studios brand) in 1911. They were among the earliest films produced by Al Christie. At least two still survive, and aside from the bizzare make-up jobs, the most remarkable thing about them was they experimented with the intertitles; insead of the usual cut to a solid frame with the narration or dialogue, then back to the story, these films had them appear on the action, like a subtitle in a foriegn language film. Sneaky Snaffles & Company (aka Snaffles de Sneak) is, for my money, William F. Marriner at his absolute peak of perfection. Artwise, you'll never find Marriner's stringy sinuous linework more playful and assured than this -- no wonder he inspired so many imitators. 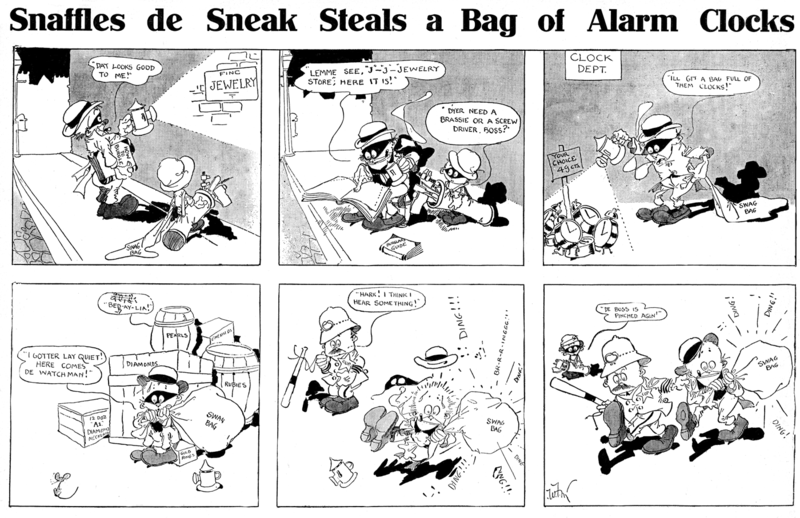 And the gags are just tremendous: in an era when 99% of all burglar strips (and there were plenty of them) maxed out their humor when the burglar got bit by the family dog, Marriner takes us all the way into Mad magazine territory, with sight gags, funny signs, and the most whacked-out moron burglar this side of Don Martin. Sadly, Marriner lost interest in this terrific feature quite quickly. He produced it for the Philadelphia Inquirer from July 31 to October 30 1904. Thanks to Cole Johnson for the sample scans. Charles Albert Ogden was born in St. Louis, Missouri, on July 14, 1889, according to the Missouri birth records (at Ancestry.com) and his World War I and II draft cards. His parents were William F. Ogden and Helen P. Hynes. A closer examination of the birth record revealed that Ogden had a twin brother, Edgar. Both were born at 1755 Morgan Street, probably at home. In the 1900 U.S. Federal Census, Ogden was the youngest of five siblings, all of whom, except Ogden, a student, were working to support the family and their widow mother, a dressmaker. Edgar was not in the census. The family address was 4242 Easton Avenue in St. Louis. Ogden graduated from the Riddick School, June 16, 1904. Information about his art training has not been found. St. Louis city directories for 1908 to 1910, said Ogden was an artist who resided at 3615 Lucky Street. The same address was in the 1910 census. Commercial artist Ogden, who worked for a newspaper, and second youngest brother, John, lived with their mother. 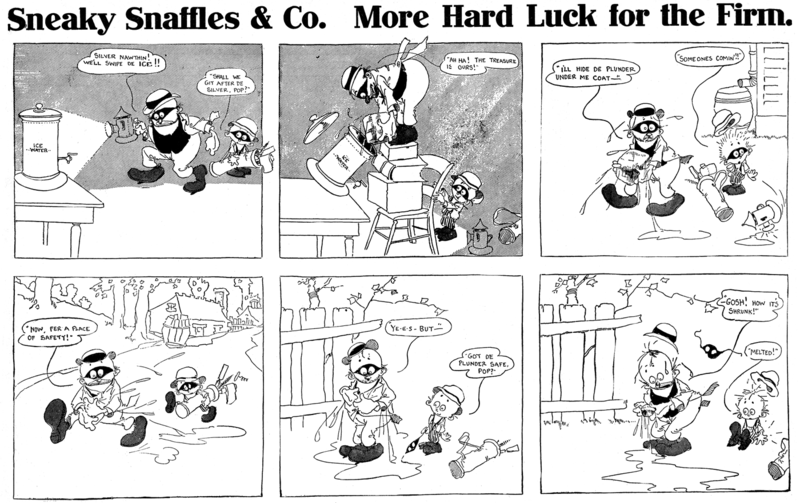 American Newspaper Comics (2012), said Ogden produced Cartoonagrams, from December 13, 1914 to May 6, 1917, for James Keeley’s Chicago Herald. Another Ogden production was copyrighted by the Chicago Herald in 1915. 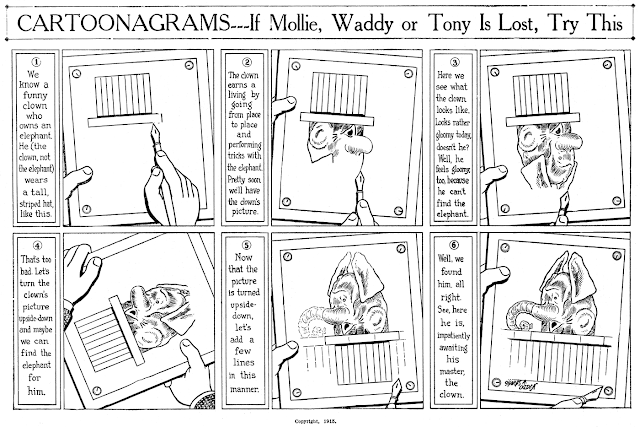 © May 30, 1915; 1 c. June 7, 1915; A 385990; Herald feature syndicate, Chicago. Chicago Commerce, May 26, 1916, reported the program of humor through music, song, verse and art that included Ogden’s Cartoonagrams. According to Ogden’s World War I draft card, he was a Chicago Herald newspaper cartoonist, whose address was 4334 Ellis Avenue. He was described as being of medium height, slender build with gray eyes and dark brown hair. On September 27, 1919, Ogden married Lola A. Woodward in Colorado Springs, Colorado, according to the State of Colorado, Division of Vital Records, Marriage Record Report. The 1920 census said Ogden lived with his in-laws in Chicago at 7106 South Eberhart Avenue. Ogden was an advertising agent. The Cook County, Illinois, Birth Certificates Index said Ogden had a daughter, Corlita Woodward Ogden. Advertising illustrator Ogden and his mother were tenants at 931 Sunnyside in Chicago in the 1930 census. Ogden’s ex-wife had remarried. She and daughter Corlita both had the Reich surname. Ogden’s mother passed away November 17, 1935. In the 1940 census, Ogden was divorced and living alone at 5220 Kenmore Avenue in Chicago. He was a freelance advertising salesman. His highest level of education was the eighth grade. Ogden signed his World War draft card on April 27, 1942. The Chicago resident lived and worked at 4544 North Racine. The Chicago Tribune, June 27, 1955, published a letter from Ogden who commented on the “Whistler’s Mother” painting. At some point Ogden moved to California. Ogden passed away April 12, 1971, in Los Angeles County, according to the California Death Index. The Social Security Death Index said his last residence was at Long Beach. Ogden was laid to rest, next to his second wife, Marie, at Forest Lawn Memorial Park. In 1914 James Keeley bought the Chicago Record-Herald and Inter Ocean newspapers, and he renamed the conglomeration of the two as simply the Chicago Herald. He also livened the paper up considerably, first adding some black and white comic features, then a full fledged color comics section. Among the first wave of new features was Charles A. Ogden's Cartoonagrams, which debuted on December 13 1914. 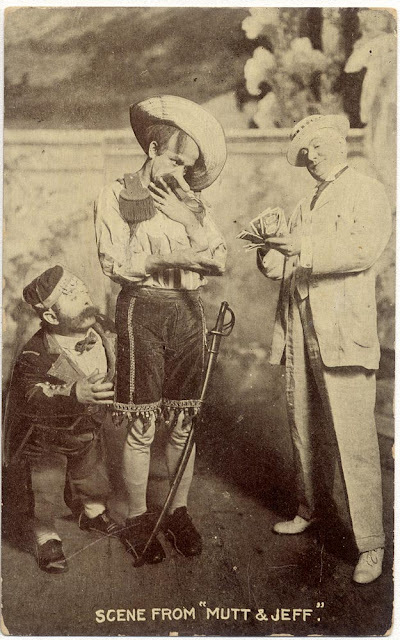 The feature offered up a newspaper version of a very popular Vaudeville routine, the chalk talk. In the typical chalk talk routine, an artist would draw as he talked to the audience. Sometimes the routines featured simple sketching, but some were more creative. A favorite ploy was to begin drawing one thing, and then as the entertainer continued drawing and talking, unexpectedly have it turn into something else entirely. 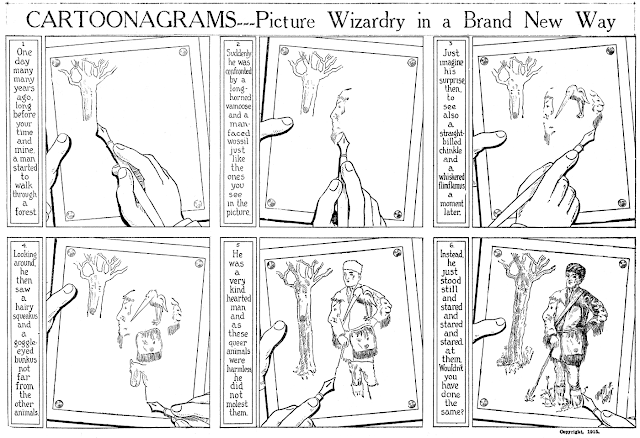 This was Charles Ogden's favorite trick, and his Cartoonagrams featured often wildly inventive turns on this idea. Reading his strips is about as near as we can get to seeing a real old-fashioned chlk talk, a form of entertainment that has disappeared so entirely that there exists hardly any record that they ever did exist. 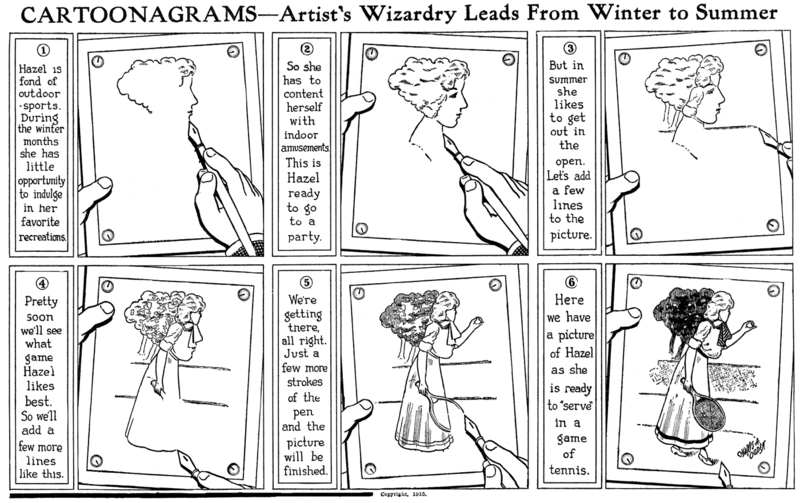 Cartoonagrams ran until May 6 1917 in the Herald, and it was syndicated though it is rarely seen elsewhere. Sadly this was Mr. Ogden's only known newspaper feature. If he did live chalk talks as well, he never made much of a splash, which is surprising considering how creative he was. Perhaps his stage presence wasn't up to snuff, or his drawing suffered in front of an audience. 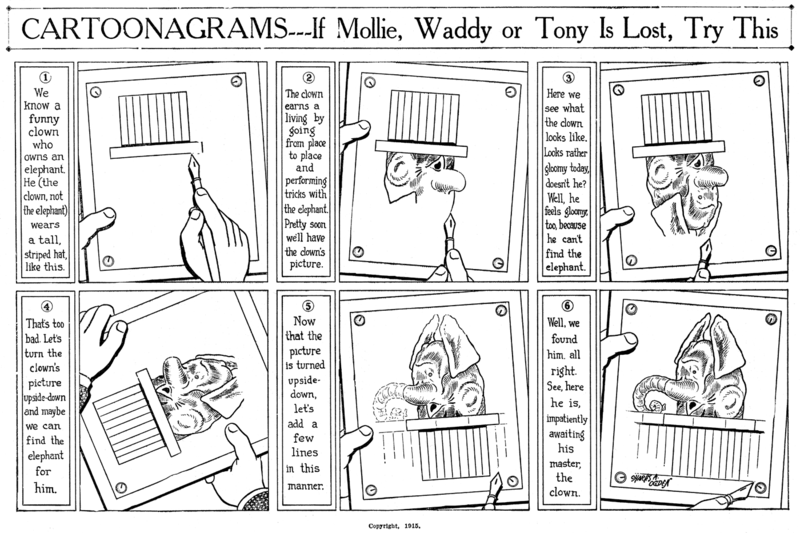 PS: if you're wondering about that headline on the top example, here are Mollie, Waddy and Tony. I own several volumes of the old Federal School and Art Instruction, Inc. mail-order art courses. Even the 1945 edition offers a number of chalk-talk tutorials. The lessons combine step-by-step visuals with patter and presentation suggestions. I wonder, though, if chalk talks were still relevant in the late 40s. But then the Art Instruction course seems always to have been a decade or so behind the curve. The 1945 course is heavy on examples from the 20s and 30s. 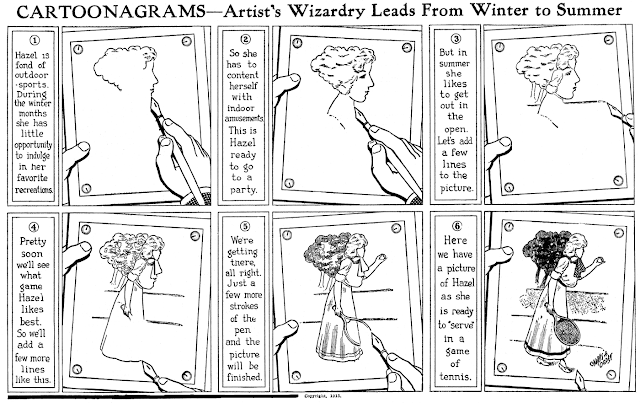 The cartoon styles pictured are likewise early-20th century. In fact the entire project seems like a hodgepodge of stuff canvassed from founding father Charles "Bart" Bartholomew's buddies. Still interesting, though. The chalk talk survived, sort of, as a cartoonist's parlor trick. In Segar's Sunday Popeye pages, there's a stretch (volumes 5 & 6 of the Fantagraphics books) where Sappo drops continuities in favor of John Sappo doing very simple chalk talk tricks as if to an audience -- usually writing a word or name and building a face from it. In the 50s Mooseketeer Roy Williams knocked out similarly simple words-into-drawings on the Mickey Mouse Club, sometimes to illustrate a song the kids were performing. The accent was on speed. I dared siblings to challenge my own skill (My wise guy older sister wrote "antidisestablishmentarianism" in small script. I made it the hair sticking from under a wide-headed guy's hat). I can't have been the only kid thus inspired. Robert Morgan “Bob” Moyer was born in Pennsylvania on January 28, 1924. Moyer’s birthplace was recorded in the census and military service. The birth date was found at Western Pennsylvania Genealogy. His parents were Harry Riddle Moyer and Fleta Eugenia Morgan. The 1927 Oil City, Pennsylvania, city directory listed Moyer’s father at 429 Grant. He was a sign painter. In the 1930 U.S. Federal Census, Moyer was the youngest of two children born to Harry and Fleta, who was not counted in the census. Moyer’s maternal grandmother, Hannah Morgan, was head of the household in Franklin, Pennsylvania at 537 Elk Street. Fleta, who was in a sanitarium, passed away about seven weeks after the census. Her death was reported in the Oil City Derrick, May 28, 1930. She was laid to rest at Franklin Cemetery. At some point Moyer’s father moved to Cleveland, Ohio. He returned to Franklin to marry Myra Grant Campbell, as noted in the marriage license application section of the Franklin News-Herald, June 19, 1936. The 1936 Cleveland city directory said the newlyweds resided at the Hawley House. Harry was a Newspaper Enterprise Association artist. In 1937 the Moyer family address was 1256 Donald Avenue, Cleveland. Harry was still with the NEA. The 1939 and 1940 Cleveland directories listed the Moyers at 17535 Madison Avenue and Harry’s occupation as artist. Moyer has not yet been found in the 1940 census. He followed in his father’s footsteps and worked at the NEA. American Newspaper Comics (2012) said John Sunley was the first artist to produce Ticklers, which debuted June 30, 1941. Moyer took over from September 1, 1941 to March 16, 1942. He was followed by Bill Arnold, Hayes, and George Scarbo. Irving S. Knickerbocker created Mac (aka The McCoys) which ran from May 10, 1929 to March 7, 1930. After Knickerbocker’s departure, it was continued by Andrew Munch, Howard Broughner and Moyer, who drew it from September 29, 1941 to May 3, 1943. Moyer was the last artist to draw the Great American Home from January 12 to 19, 1942. On February 18, 1943, Cleveland resident Moyer enlisted in the army during World War II. He was single and a commercial artist who had two years of college. Moyer’s father passed away January 21, 1946, in Cleveland. The 1950 Lorain, Ohio city directory listed Moyer at 2447 East 37th Street. Moyer resided at 3641 Spencer Road in the 1960 Lakewood, Ohio city directory. He was a commercial illustrator at Fawn Art Studio. Moyer is a noted illustrator and watercolorist who had an exhibition, in January 2005, at the College of Wooster. A retrospective of his work was held September 2015.